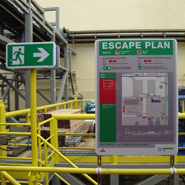 The value of professionally implemented and installed escape route markings is proved during emergencies and evacuations. It is the principal way of ensuring that personal injuries and material damage are limited during emergencies. 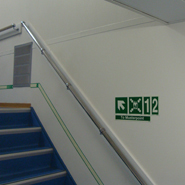 Occupational health legislation and various other legislation and regulations also require escape route marking. 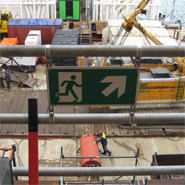 Regardless of a person’s location inside a building, at a site or factory premise or on a ship or offshore installation, rapid evacuation must always be possible. Unambiguous communication in the escape route marking under every circumstance is extremely important. It must always be possible to find and recognize the various applicable escape routes at a glance. Uniform escape route marking leads you to safe surroundings or a muster or assembly station. Ships and offshore installations require additional directions to lifeboats and life rafts. 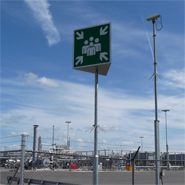 A carefully considered and properly applied escape route marking system is part of every evacuation plan. It allows controlled evacuation or embarkation.